Designed to Meet Your Operational Needs. KME Eliminator™ tankers are designed to carry a large amount of water, with unmatched handling capabilities, while still providing the customer with hose storage space and ample compartment options. The Eliminator™ tanker line is available in capacities ranging from 1,000 to 4,000 gallons. The Eliminator™ tanker is custom designed to lower the water tank center of gravity and distribute the water between the front and rear axles for a better handling - this also reduces the cost of ownership. The Eliminator™ body provides a large water storage capacity without sacrificing compartment space. Hundreds of compartment configurations are available ranging from simple low side compartments to full height/split depth compartments for pumper/tanker configurations. The Eliminator™ pump panel features an angled gauge panel for an improved view of the control from the standard operating position, while still keeping the pump panel width as tight as possible. Packaged with a 1500 gpm rated pump performance and lowered single stack crosslays. 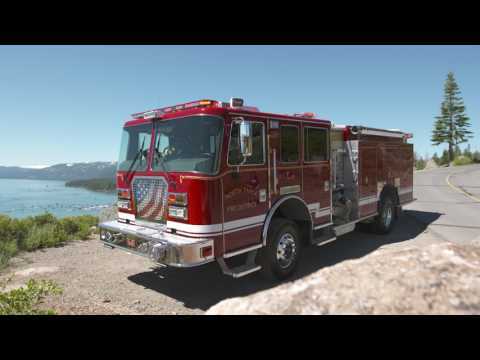 "GET HOME SAFELY" with KME featuring Greenfield Center Fire Company #1 "We need to trust that the apparatus will get us to the job and back home again. KME rigs are the toolboxes we need to help save lives. At a moment's notice it has to be reliable and perform the way we need it to. I have complete trust in every KME fire truck we have"